TUGUEGARAO, Philippines — Typhoon Mangkhut lashed the northern Philippines with destructive winds and heavy rain that set off landslides and destroyed homes on Saturday as Hong Kong and other parts of southern China braced for the powerful storm. By Sunday morning, the death toll had climbed to 25, according to Cabinet secretary Francis Tolentino. On Sunday, Hong Kong issued a hurricane warning on the highest level of its tiered system, warning of winds of 118 mph could hit the area. 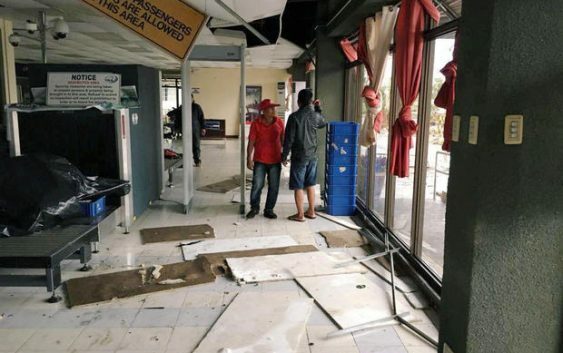 Tuguegarao Airport is damaged due to Typhoon Mangkhut, Tuguegarao City, Philippines September 15, 2018 in this image obtained from social media.